Assuming the overall price of the contract includes only the cost of supplies of Russian gas, then the $400 billion price tag means China will pay about $350 per 1,000 cubic meters. Delivery price for the contract will be tied to market oil prices, Putin said from Shanghai on Tuesday. Infrastructure investment from both sides will be more than $70 billion and will be the world's largest construction project, with Russia providing $55 billion up front and China $22 billion. This is Gazprom's biggest contract to date. A memorandum of understanding was signed in the presence of Russian President Vladimir Putin and President of China Xi Jinping on the second day of Putin’s two-day state visit to Shanghai. According to Miller, the deal was set to go through at 4:00pm Shanghai time when he understood "all fundamental issues were resolved." RT producers were informed of the landmark energy deal prior to its signing after a conversation with Miller. The deal comes as a part of Russia’s larger-scale pivot to Asia and especially China as Western economies threaten sanctions over turmoil in Ukraine. Sanctions by the US and the EU have been mostly limited to visa bans and asset freezes on some of Russia’s top officials, while so far only threatening a so-called third round of real economic sanctions against Russian hydrocarbon businesses. A major breakthrough in negotiations came on Sunday as Gazprom chief Aleksey Miller sat down with his CNPC counterpart, Zhou Jiping, in Beijing to discuss final details, including price formulas. Although Europe is still Russia's largest energy market – buying more than 160 billion cubic meters of Russian natural gas in 2013 – Moscow will use every opportunity to diversify gas deliveries and boost its presence in Asian markets. “I wouldn’t look for politics behind this, but I have no doubt that supplying energy to the Asia Pacific Region holds out a great promise in the future,” Medvedev said. 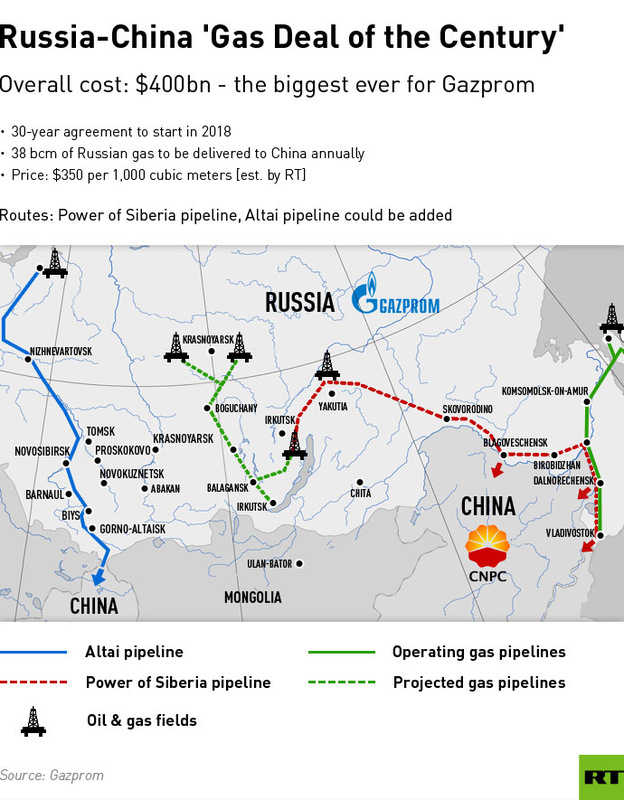 In October 2009, Gazprom and CNPC inked a framework agreement for the Altai project which envisions building a pipeline to supply natural gas from fields in Siberia via the western part of the Russia-China border. In March 2013, Gazprom and CNPC signed a memorandum of understanding on Russian gas supplies to China along the so-called eastern 'Power of Siberia' route. When both pipelines are activated, Russia can supply Asia with 68 billion cubic meters of gas annually. Last year, China consumed about 170 billion cubic meters of natural gas and is expected to consume 420 billion cubic meters per year by 2020. Expect democracy movement to gain pace in China. Damn $400 billion is a huge amount...i say Pakistan should also talk for gas export from Russia.